…Alex and I have embraced the American lifestyle. It’s Saturday afternoon. We went for a walk through the New Jersey Meadowlands taking meaningful photos that artistically illustrate the juxtaposition between industrial installments and their impact on the beautiful nature that surround them. After being outdoors for three hours, we went home, used our old bananas to make an organic bread loaf, which we had for our afternoon tea, which was served on grandma-patterned Arzberg porcelain. I am now reading Mannahatta: A Natural History of New York City while Alex is crocheting a new winter cap made with the Alpaca wool that I bought for him in Paris. That might have been our German selves. Nö…. It’s Saturday afternoon, and we’re in Jersey. It’s 4:57 pm and my phone is registering 115 steps for the day. I am still unshowered and the apartment is in a bit of a state. We were sitting in our pyjamas eating potato chips and Häagen Dazs on the couch while binge watching The Good Place on demand. Our lunch, btw, was heated up leftover burger patty from last Sunday (for Alex) and ready-made Asian salad with rice noodles from Trader Joe’s (for me). We moved rooms once – from the couch to the office and back – because Episode 6 for some reason would cost $ and it’s free if we watch it online. Do I feel guilty? Fork no! It’s quite a rare thing to have a lazy day. When we’re back in Munich, our weekends will be packed – whether with our house project or social obligations and other events – that we’re going to look back on this day and think, wow, remember when…? We will leave the house at some point. To head out to the nearest mall so that I can buy make up (which I never wear in Munich) and we can eat masala dosa for dinner in the fluorescent food court. Because: 1. it’s Jersey, and there are many South Asians in this area to create a demand for dosas; and 2. it saves me the effort of making dinner, which I started to hate doing, because I have done a lot of cooking since I started working from home. Last night we did manage to do something somewhat high-brow. 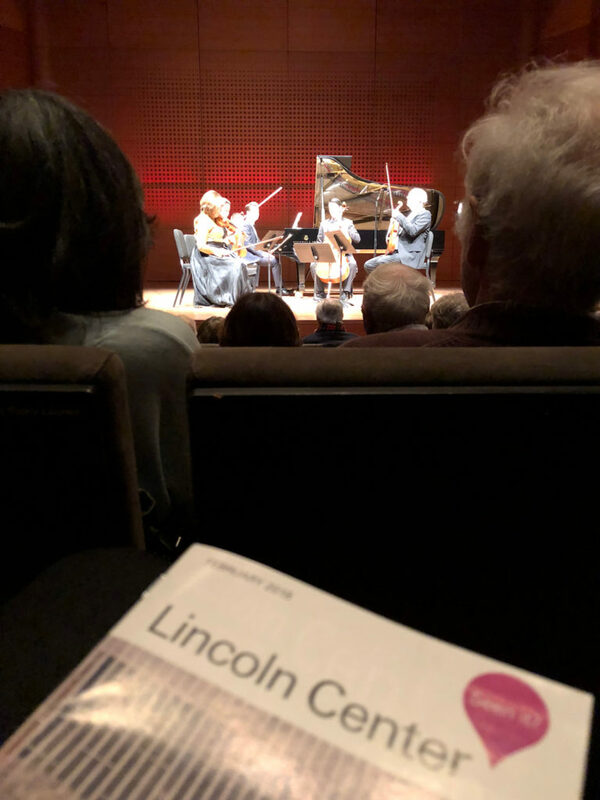 We attended a concert at the Lincoln Center. As a classical music neophyte, I had never heard of César Franck, and this was a beautiful introduction. It happens to be Must-See-New-York Week, so we sat in some of the best seats in the house for a bargain. Brilliant. Right, I must now leave my cocoon and get ready. Just wanted to check in real quick and say hello. Last weekend, btw, I had – to borrow someone’s word – a most “epic” weekend. Our little group from ASIJ had a mini reunion and hung out the entire weekend. Soooo many memories came tumbling out. I haven’t laughed so much and so loud in a looong time. A report on that later. Wishing you all a lovely and lazy rest of the weekend!